"Live" distributions of Linux offer a wonderful convenience for those not quite ready to commit to the open-source operating system. By booting Linux directly from a CD (which you burn from a downloaded .iso file), you can try it out without first installing it onto your hard drive. But live Linux CDs have their problems. Optical media is slow. It's also read-only, limiting your ability to configure the operating system. Finally, many of today's netbooks and ultraportable laptops don't have an optical drive. The Universal USB Installer (free) offers a simple and elegant solution to those problems. 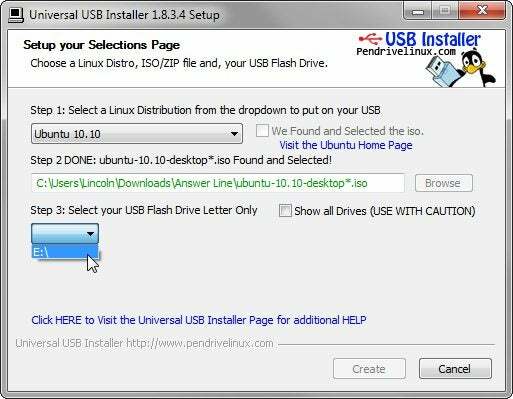 The Universal USB Installer offers a broad selection of Linux versions to install on flash drives. The program supports a huge number of Linux variations, including the popular Ubuntu, Debian, and Puppy--a favorite of mine for Windows data recovery purposes. Universal USB Installer also supports some programs that we don't think of as Linux, although they are if you look closely, such as EASEUS Disk Copy and DBAN. When you select your Linux flavor, the Universal USB Installer will look for the needed .iso file in the current folder. If it doesn't find it, it will offer to download the file for you or let you tell it where on your PC to find it. There is one slight danger: You have to select which drive Universal USB Installer writes to, and by default, it only shows you external drives that were already plugged in when you launched the program. You can see all of your drives--internal and just-plugged-in externals, if you check the Show all Drives option. If you do that, it's possible to select the wrong drive and render Windows unbootable. You'll get plenty of warnings, however. Universal USB Installer provides a remarkably easy way to run Linux onto your PC.